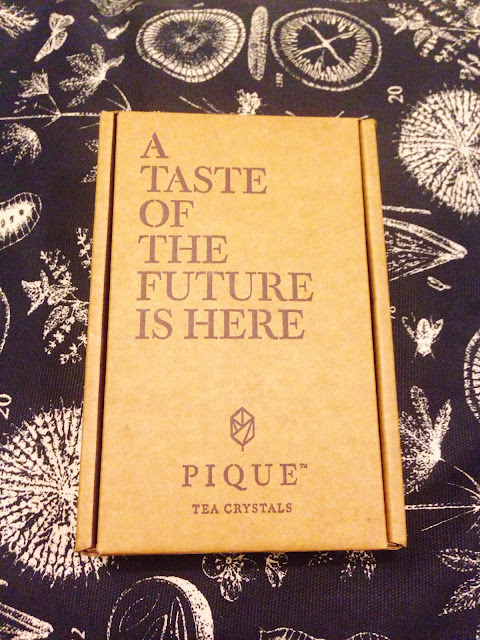 I wasn't sure what to think before I opened the package of Pique Tea tea crystals. I liked the minimalist look, and was intrigued by the idea of organic whole leaf tea that's been brewed and then crystallized. I've had instant teas before with less than stellar results, so I proceeded with caution. 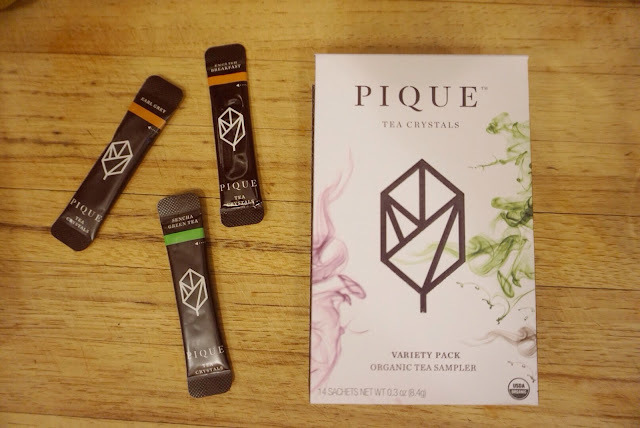 Pique's crystalized tea is inspired by cha gao (which translates to 'tea paste'), a method of creating a tea extract paste and then allowing it to solidify into various shapes. For an entertaining look at cha gao, check out this post from the Lazy Literatus. Per the Pique tea website, the instant tea is created through "a proprietary process that slow brews and extracts the fresh flavor and nutrients of whole leaf tea at optimal levels and locks it in a crystal form." I was sent a few different varieties to try, and I decided to brew up three basic teas: English Breakfast, Sencha, and Earl Grey. I prepared all three according to the package. You put the crystals in a cup, and pour in a cup of water using the correct temperature based on the type of tea. First up was the sencha. The crystals had a light vegetal scent. Once the water hit them, the brew had a light green veggie flavor. Not the grassy tones I was expecting, I kept tasting cooked celery. It had a savory umami flavor to it, like a celery soup. Not a bad thing, just not what I was expecting. Then I went for the English Breakfast. The crystals had a malty aroma. The brew was dark brown and the flavor was malty and strong but surprisingly smooth with a little astringency. I like an English breakfast blend that has enough oomph to properly wake me up, and this one definitely had that. However, it didn't have the hint of brightness and nuance I usually look for in my favorite breakfast teas. This tea was drinkable, but it would be enhanced with milk and sweetener. The strength would hold up well. Finally I went to the Earl Grey. The Earl and I don't always play nicely together, but I figured I'd give it a try. 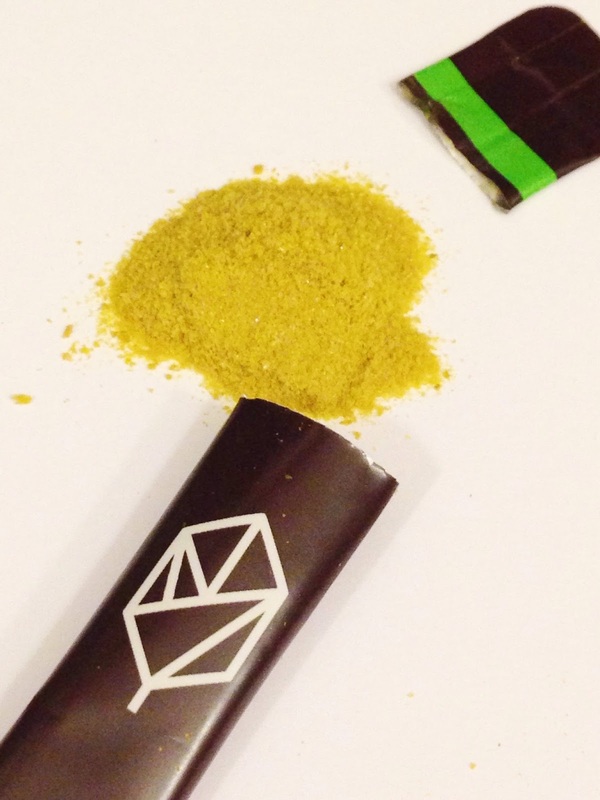 The crystals had a citrusy and malty aroma that grew stronger with the hot water. The black tea had a similar flavor as the English breakfast, malty, strong, and smooth. I didn't mind the bergamot flavor in this tea because it wasn't overpowering. It was subtle, but definitely present. So after tasting these teas, I'd recommend them as good for camping and traveling, basically at times you aren't in the mood to brew loose leaf teas (is that even possible?). They are good basic teas, but lack a bit of nuanced flavor. I like that the crystals are a modern take on cha gao, so it combines new and old techniques. 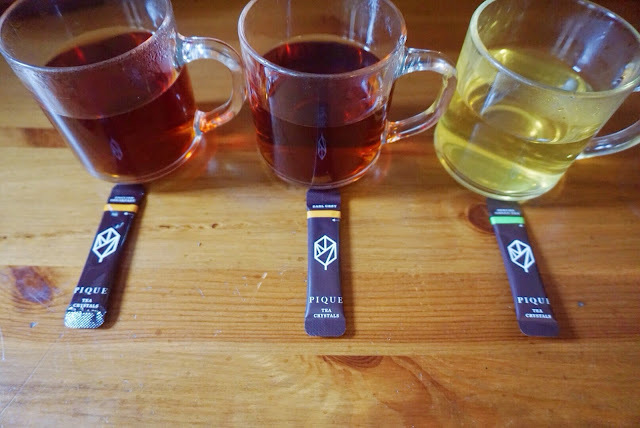 It's always interesting to learn about new ideas in tea, so I'm glad I was able to give Pique a try. If you are interested in checking out Pique tea, you can get $5 off your order by using code TEAHAPPINESS. Just visit their website here. Thank you to Simon for the samples!